Welcome to the Pure Vanilla Extract Giveaway! Did you know that July is National Ice Cream month? With 31 days of deliciousness upon us, it may be time to whip up some homemade ice cream a time or two. Krista over at Savory Savings recently shared her Coconut Vanilla Ice Cream recipe featuring the delicious vanilla from Nielsen-Massey – be sure to check it out and save it for a hot day later this month! 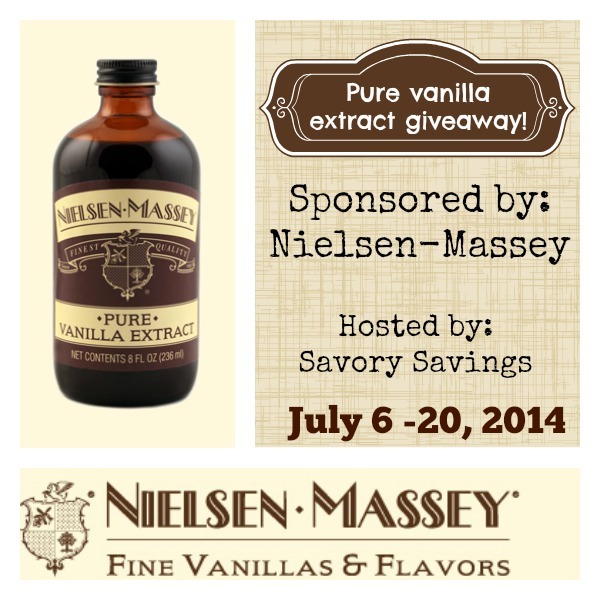 How would you like to win a bottle of pure vanilla extract from Nielsen-Massey? If you would like a chance to win, enter with the Giveaway Tool below. If you have won a Nielsen-Massey giveaway anytime from another blog in the last 12 months, you are not eligible to win this giveaway. The giveaway will run from July 6 through July 20, 2014 at 11 PM CST and is open to US residents, ages 18 and older. Entries will be verified. Winner will be notified via email (consider adding gloriouslygreengal@gmail.com to your safe list) – winner will have 48 hours to respond and claim prize or another winner will be selected. I think their Lemon Extract would make a delicious Lemon Cake & Icing to serve with Great Vanilla Ice Cream! My favorite ice-cream flavor is vanilla and I would add coffee extract to it and chocolate shavings to make a sundae. I love mint chocolate chip. I would use a little peppermint and chocolate extract to make this ice cream (along with choc chips)! I wonder what adding a little Pure Tahitian to the ice cream maker would give us? A bowl of yum! I love Butter Pecan Ice Cream. I think The Vanilla would make a great sauce for that flavor! Oh, my goodness, wouldn’t the Madagascar Bourbon Pure Vanilla Sugar be amazing in a homemade ice cream! Just saying that makes me drool, lol.